The Nilfisk Roof Cleaner is a total roof cleansing solution. 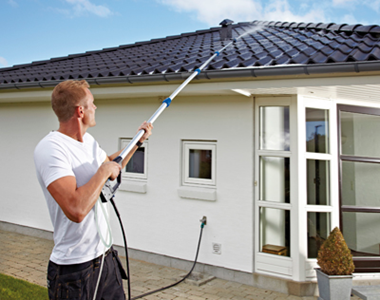 Designed as an accessory for pressure washers and with a specially developed detergent, it allows home owners to wash the roof without having to leave the ground. This do-it-yourself product is suitable for most houses, and it means that this important task can be carried out without having to hire professional specialists to do the work. It is believed to be the first such dedicated solution for roof cleaning. Regular roof cleaning is recommended in order to remove accumulated dirt and other debris that can have a negative impact on roofing materials, as well as on the visual appearance of the building. The Nilfisk solution enables this task to be performed on single-story buildings quickly, easily and safely. The unit consists of a telescopic lance extending to a maximum length of 4.2 metres. The pencil jet foam nozzle, however, can spray up to a height of 11metres, giving a total working reach of up to 15 metres. The system sprays a low-pressure film of foam onto the roof that dissolves the dirt. Natural weather action then leaves the roof clean. - Can be used for other cleaning applications, such as caravans, greenhouses, etc. Can be used on all Nilfisk pressure washers with quick connection for gun and hose. For other models without hose reel an adapter hose is available.